Addicted to a kind of dolls recently. First Pullip doll i saw was on YesAsia. i was searching for Hello Kitty and I saw her. There's even a set of 3 dolls from sanrio! Pullip Melody, Dal Cinammonroll, Pullip Hello Kitty. I want to order from YesAsia but i realise that it's not worth. shipping plus everything it's already RM2xx extra thatn the original price. After that, i joined a forum about Pullip and i met some very nice member there. They taught me a lot about these dolls. How to customize,take care,rewig and etc. They do recommended me websites and shop about these dolls and let me grab a few great deals on the dolls. 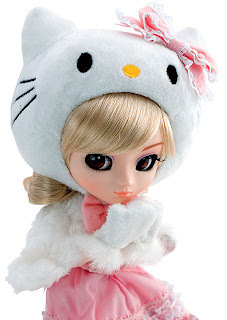 In fact,i tried to grab the Pullip Hello Kitty on ToyMalaysia but i failed. That's really a high demand doll now. At last.i get a second hand one from a seller. I love my new hobby and i hope it last long although i'll really broke buying such expensive doll. It's just too hard to resist from dolls with such pretty face. Self-introduction : Pullip refuses to be ordinary, yet seeks for ‘diversity’ and ‘being special’. Now she is in a private high school in Milano, Italy. Pullip who has attractive looks with big eyes is sociable and positive. She gives out his energy and talent by participating in a drama club. Tae-Yang is her boyfriend who meets Pullip’s high standards. Now he is majoring in musical composition at the College of Music. Pullip’s father is a diplomat and her mother is an interior designer. Pullip is a friend-like sister to her brother, ISul, who is studying abroad in the U.S.A. Pullip who inherited international senses and artistic attainments from her parent is very popular among her friends. -Product Description : It can give a wink and control its eyes by moving the pupil of the eye from side to side. It can also make various poses because it has many joints all over its body, which is the reason why this product is special and different from others. pictures – All of these are my favorites and also what I always love to do. -Personality : Active, Positive, Sociable, Extroverted, Cheerful, She loves to enjoy a luxurious life. I also really like Korean food, Bibim-bab that my father makes. -Favorite books : I love to read all kinds of fashion magazines and also decorate things. special, exceptional and various styles. I don’t like ordinary and common styles because I’ve got my own style. the master of my fate. Father : Korea, a diplomat, When he worked in Italy, he met Pullip’s mother.